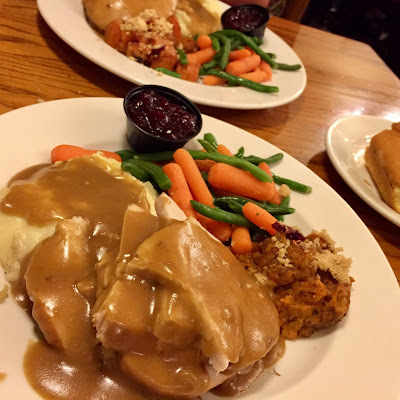 If you didn't go to go to someone's house for Thanksgiving dinner, it's likely that you headed for Marie Callender's. Marie Callender's is already a producer of pre-ordered holiday feasts and pies, which they sell and distribute en masse on Turkey day for those who want to host Thanksgiving but don't want to bother with all the cooking. 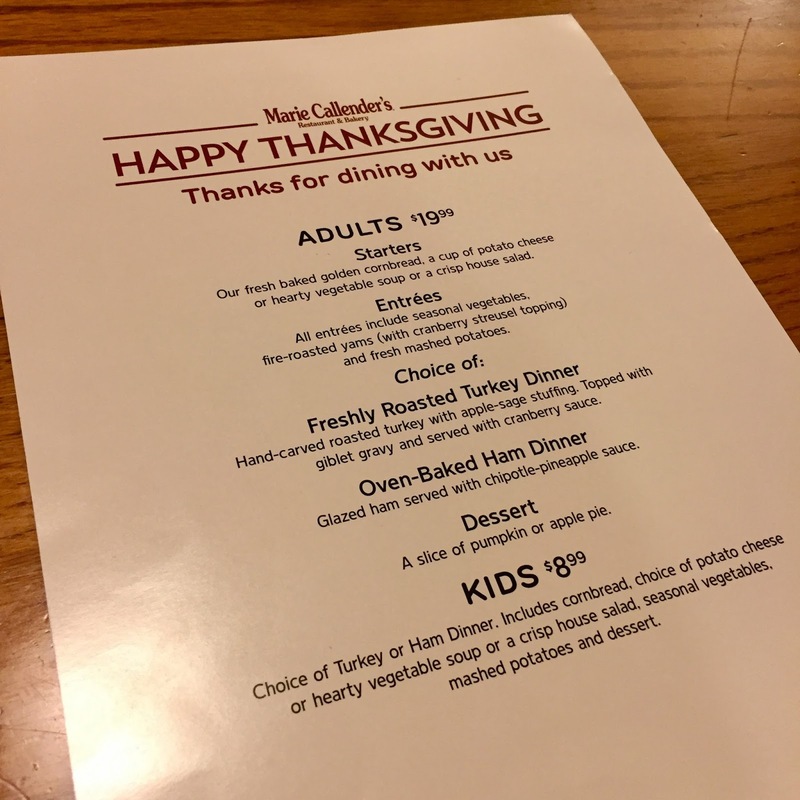 But for some of us who also don't want to clean up dirty dishes (or wish to limit the family togetherness to business hours), there's the restaurant itself, which is open until about 7 to 8 p.m. to serve a Thanksgiving prix-fixe with all the bells and whistles. Though not all Marie Callender's restaurants are actually open for dinner service, this year, those that did priced it for $19.99 per person. 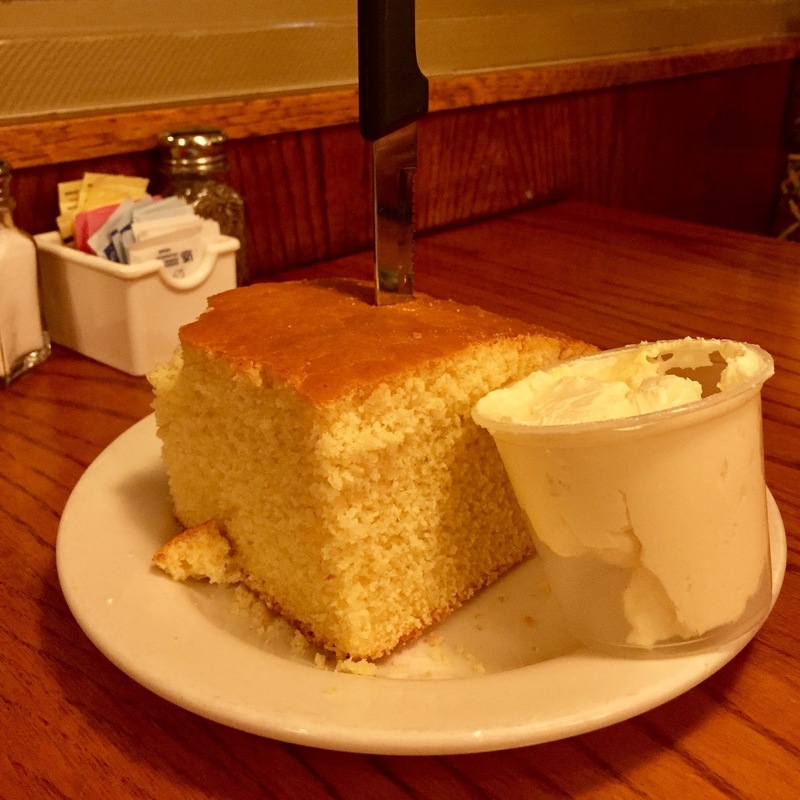 It starts with a humongous hunk of warm cornbread with clouds of whipped honey butter. After that comes a cup of soup or salad. 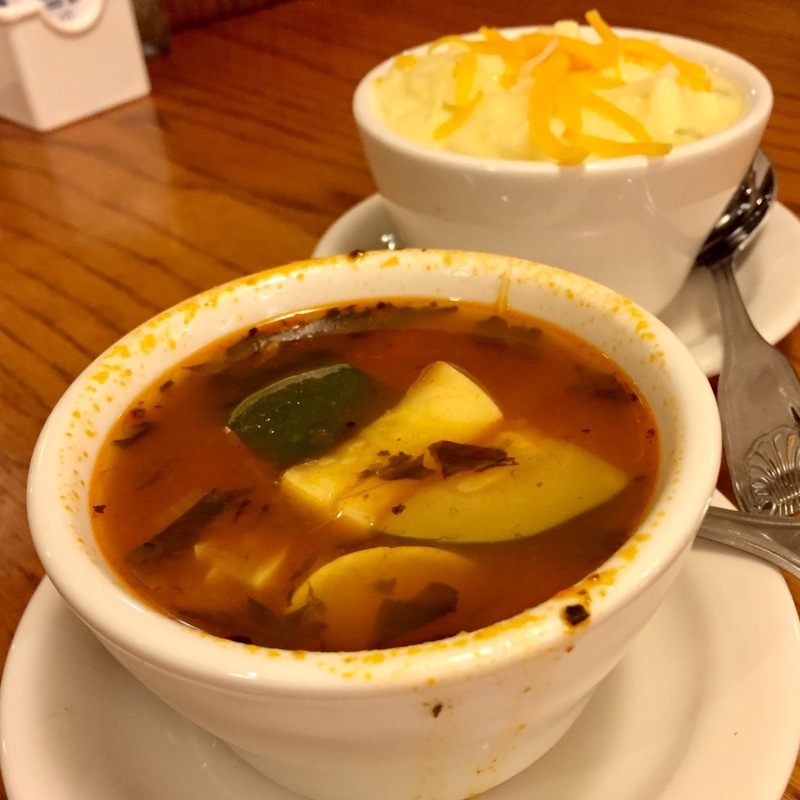 The soup can be either a potato cheese soup that tastes like a potato gratin put through a blender, or a vegetable soup akin to minestrone with peas, beans, and corn. The salad is a standard green house salad, but Thanksgiving is no time for salads. For the main attraction, Marie Callender's offers baseline stuff: either ham or turkey breast which are thick-sliced and covered in a salty gravy. If you get the turkey, every plate gets enough meat for about two servings--all of it white meat that's uniformly tender and unnaturally moist. The herb stuffing hidden beneath the slabs tastes a lot like Stove Top (as it should), and the mashed potatoes gave me flashbacks to my high school cafeteria (which isn't a bad thing). The steamed carrots and green beans are just that: steamed. The carrots to a tender crisp and the green beans, limp but still squeaky. There's also heaps of candied yams topped with streusel, and a thimble of cranberry sauce that's equal parts jelly and actual berry. 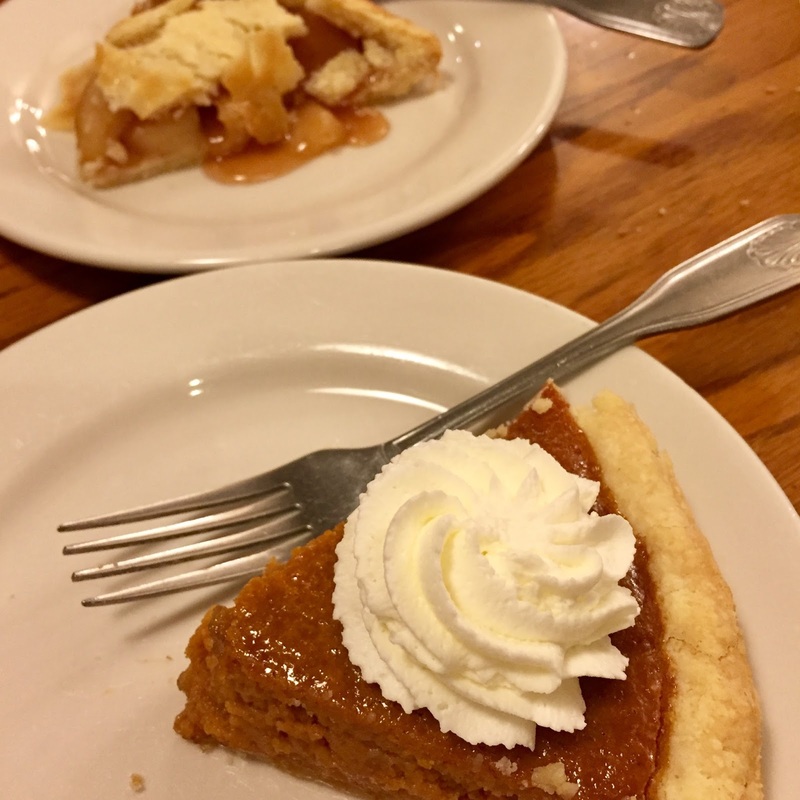 And of course, a slice of pie comes as dessert: either the pumpkin, which is always dependable, or the apple, which needs ice cream. As far as consistently predictable turkey dinners go, Marie Callender's offers the kind you can set your watch to. For the one in Fountain Valley, it's up to 7 p.m.
We had a layover in Atlanta--a few hours to spend in the city before catching an early-morning flight to our final destination. So what did we do? 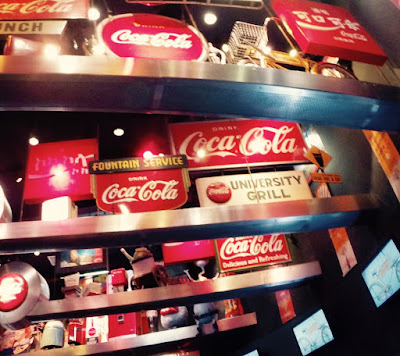 The two things any time-crunched Atlanta tourist would do when allotted such a short period of time: we went to The World of Coca Cola and then we ate fried chicken. The World of Coca Cola was a pleasant two-hour diversion. At the start of the self-guided tour, we watched an obligatory introductory film. But instead of a history of the world's most famous drink, it was a fifteen minute-long commercial designed to give us the feels. Among the "stories" told: a mom being reunited with her soldier son and a young couple surprising their parents with news of a baby. By the time the lights went up and the screen retracted to reveal a door to the rest of the attractions, there wasn't a dry eye in the house. We then took in everything this uniquely Atlantan site had to offer. We took a selfie with the Coca Cola polar bear. We walked through the bottling exhibit and the "secret recipe vault". And, of course, we drank lots and lots of free soda. And my God was there a lot of soda. There was the bottle of Coke they give you as you enter; the free souvenir bottles of Coke you can take as you leave; but the culmination of it all was the soda sampling room where we tasted different flavors of soda from all over the world, all of it chilled and some of it more delicious than Coca Cola itself. 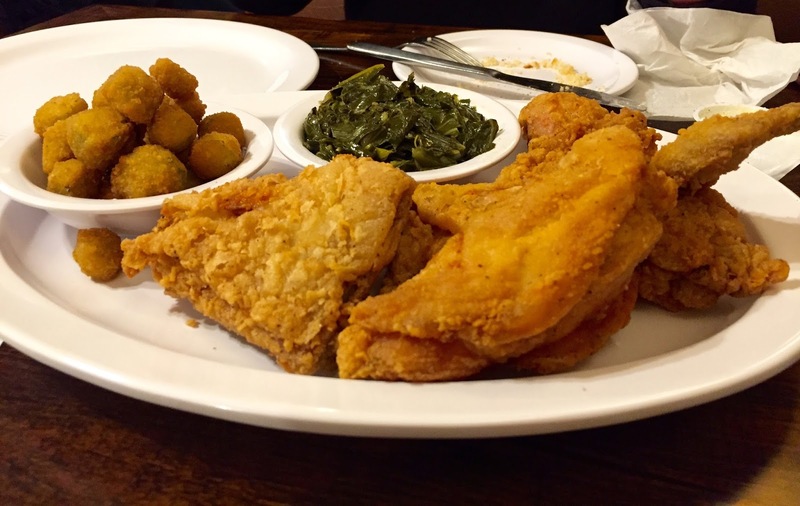 On a sugar high and hungry for solid food, we found Busy Bee Cafe, an institution for fried chicken and all other forms of soul food since 1947. It's the kind of place that has never looked to be lauded by TV shows, newspapers and foodie magazines, but has been anyway because what it does it does well and in earnest for as long as anyone could remember. The walls are plastered with framed articles and autographed photos from celebrity fans. And when I sunk my teeth into that drumstick, I realized that this was the best Southern fried chicken I've ever had--better than Gus's in Memphis and certainly better than any fried chicken I've had in California (*cough* Roscoe's *cough*). It was greaseless, hot, and perfectly cooked--not overfried, not underdone--just right, and juicy, even the white meat. It's brined properly so that every molecule of the meat was succulent. Also, floured just enough so that the skin had a chance to fully render in the oil and form a crunchy crust so addictive, I was picking at bones to extract every single bit I could find. The sides were just as wonderful: collard greens that I could've eaten by the bucketful and fried okra, which, I admit, are never not good. Can I get an "Amen"?